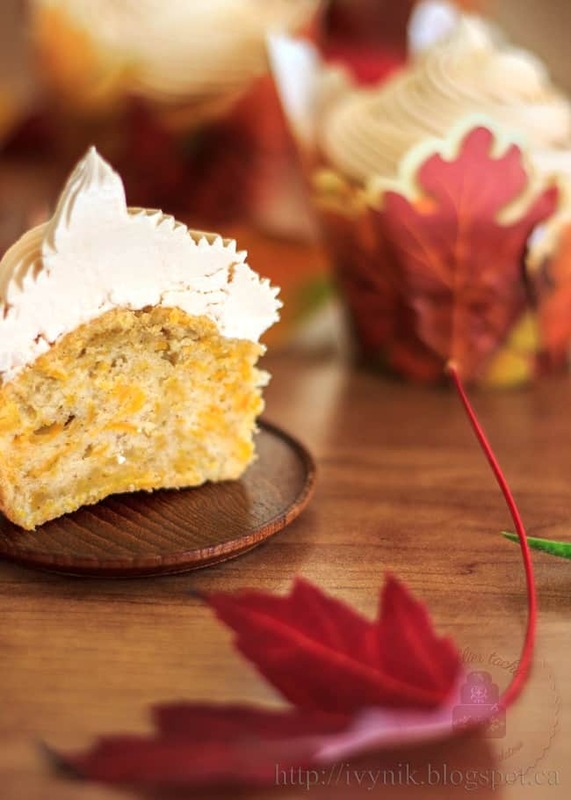 This post is courtesy of our contributor Ivelina…This family-size Butternut Squash Muffins recipe comes with a touch of fall colours and aromas just in time for Thanksgiving. Happy holidays, dear friends! 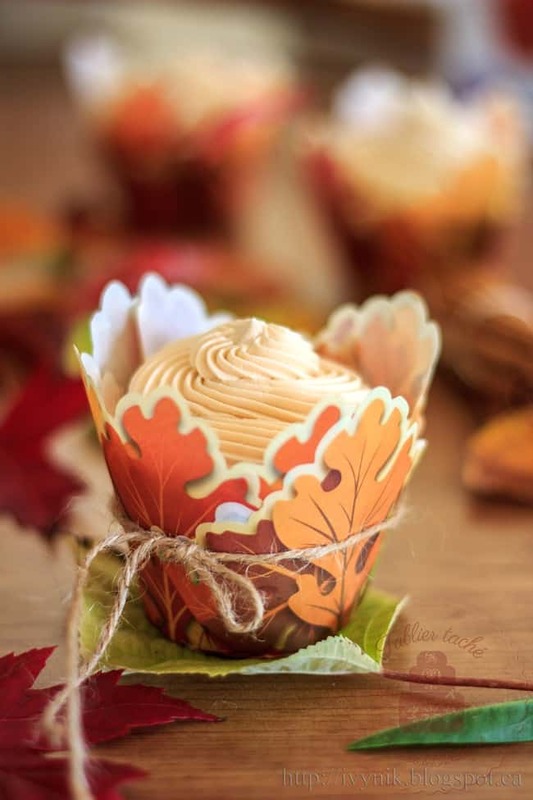 You will need caramel sauce for the buttercream (recipe included below). Caramelized sugar enhances the flavour and adds a nice warm colour to the icing. The sauce is very easy to prepare. It will take you 5 minutes, or even less. Preheat the oven to 170°C. 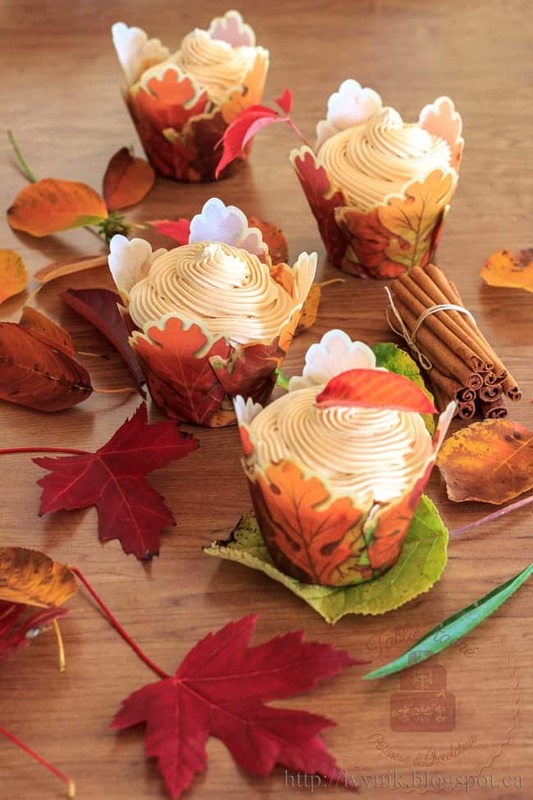 Prepare a cupcake baking dish, lining it with paper cups. In a bowl, scale the dry ingredients - the flour and all the spices. 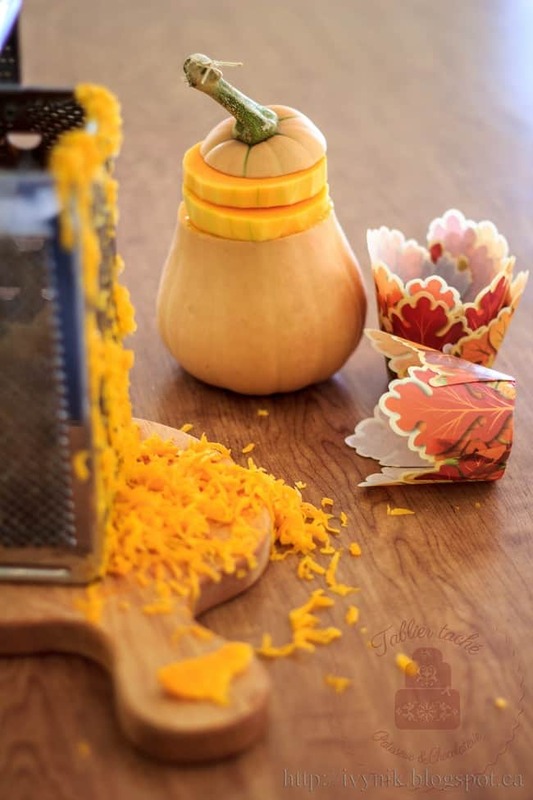 Grate the squash. Set aside. In a separate bowl, beat the eggs with the sugar until pale and foamy. Add the oil. Add the dry ingredients to the egg mixture in two additions, stirring just enough to incorporate. Add the squash. Stir well to homogenize. Fill the paper cups in the baking dish, just few millimeters below the edge. Bake for about 20 min. Check with a toothpick in the centre of the middle muffin if they are baked enough. Rotate the pan half way through baking. Remove from the oven. Let them rest for 7-8 min in the pan. Arrange them on a wire rack to cool completely. Combine the sugar & water in a heavy sauce pan. Bring to boil, stirring to dissolve the sugar. Cook the syrup until caramel is formed. If you use a thermometer, it should measure 160-165C. If not, make sure that you do not overcook the caramel - when it turns amber colour, reduce the heat to very low and remove before it darkens. Remove from heat and cool for few minutes. In a separate pan, bring the cream to boil. Add slowly to the caramel, stirring constantly until caramel dissolves. Set aside and let it cool. Dissolve the sugar into the water in a heavy bottomed pan over heat. Bring to boil. Cook the syrup for 2 minutes. While the syrup is cooking, beat the whites until soft peaks form. Keep the mixer running and add the syrup very slowly until use all of it. Continue beating the egg-sugar mixture until cooled to a room temperature and firm peaks are formed. In a separate bowl, cream the butter until light. Beat in the caramel sauce. Add the meringue a little at a time, combining very well before next addition. The emulsion has to be formed - creamy soft and light texture. If it is too soft, refrigerate a bit but not too much - just enough to be able to ice the cakes. Spoon the buttercream in a piping bag with a tip of your choice. I used Wilton 4B, but you could really choose whatever speaks to you at that moment. Pipe swirls on top of the cooled muffins. Refrigerate. 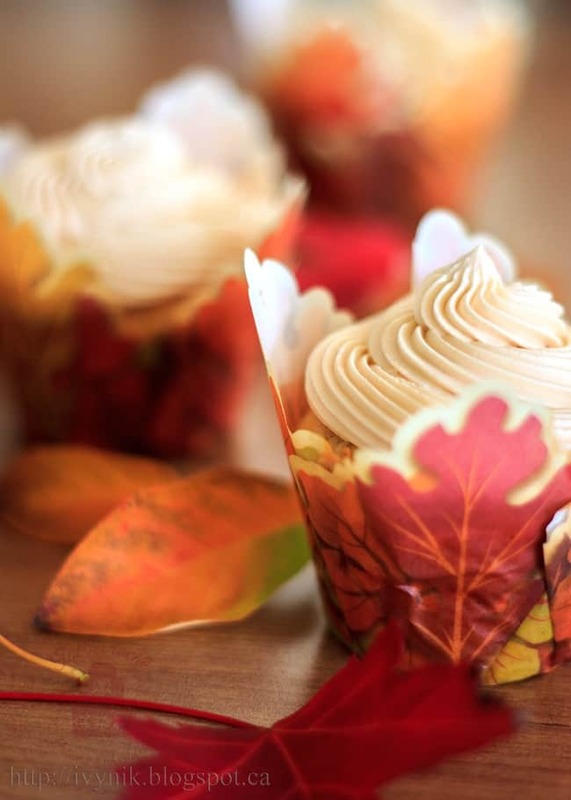 Visit our Thanksgiving page for more delicious ideas. We’d like to extend a huge Thank You to our fabulous new contributor Ivelina. She is an amazing baker and I know you’ll love what you see over on her Tablier Taché blog, her Pinterest boards, her Facebook page and her Google+ account. These look delicious! def going to have to try them! Thanks for linking up to DIY Inspired! So much style pand refinement! love the look, love the gorgeous photos, no doubt would love the taste! can’t wait for the next recipe! 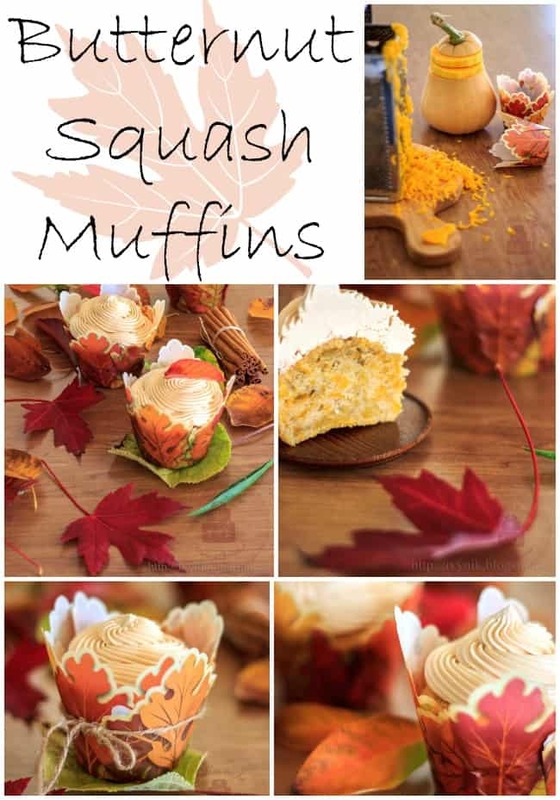 Amazing butternut squash muffins, I make bread from butternut, I will book mark this recipe for future use! Love if you share this on Fabulous Friday Party.